With most events in history nothing is as black and white as we think. The War of 1812 was one of those. 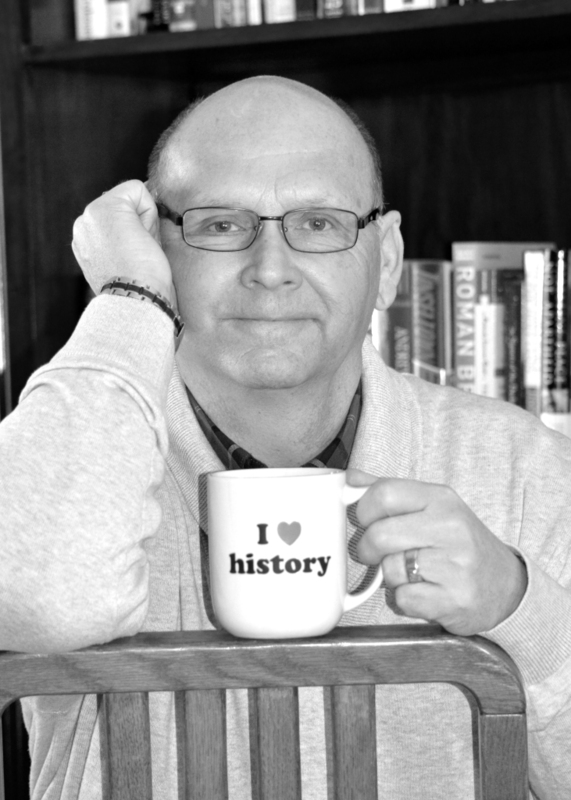 While American history tends to focus on the American Revolution and Civil War it was the War of 1812 that would cause more changes in the Untied States. After President James Madison presented to Congress the grievances against Great Britain on June 1, 1812, Congress took up the debate on formally declaring war. It’s not clear if this was the intention of President Madison since his message didn’t specifically ask for a declaration of war. The House debated for four days before voting 79 to 49 for war, with the Senate agreeing with a 19 to 13 vote. This would be the first declaration of war for the new United States. On June 18, 1812 James Madison signed the declaration into law, formally starting a conflict that both the United States and Great Britain were unprepared for. It was only twenty-nine years since the end of the American Revolution and twenty-three years since the U.S. Constitution went into effect. The United States was just beginning to learn what being a nation was about. Many of the nation’s policies before this war were based on fears it had from the Revolution and what the founders knew of Europe. One of those fears was not having a large standing army which could be used to overthrow the government. However on the Canadian front at the start of the war the United States did fairly well. This was mostly due to the fact that the greatest number of America’s regular trained army was already there from its involvement in the Indian wars. Another reason for the United States early successes was that Britain was a little busy with the French in Europe, and had little concern about their former colonies. Although the United States saw the War of 1812 as just its war it was in reality a true globe conflict. Through the first two years of the war most of the fighting took place along the northern border between the United States and Canada, and on the lower Great Lakes. The defense of Canada was done mostly by the Canadians because the British were heavily involved in the European War of 1812 against Napoleon Bonaparte and France. In fact many of the issues that caused the United States to declare war were based on what Great Britain had imposed on the U.S. due of their fight against France. These were trade sanctions and the U.S. merchant sailor “impressment.” It wasn’t until 1814 that things dramatically changed in the fighting in North America, and that many of the events that American’s hold dear came about during this period. On March 30, 1814 Napoleon surrendered to the British and their allies after his devastating defeat in Russian. On April 6 Napoleon abdicated his power in France, and although Napoleon would return to meet his Waterloo at Waterloo this short respite allowed Britain to turn their full attention to the war in America. On July 18, 1814, A British 74-gun ship of the line and its support ships sailed into Passamaquoddy Bay Maine. The small American detachment at Fort Sullivan, both out manned and out gunned, surrendered. This began the occupation of Maine by the British. At that time Maine was part of the commonwealth of Massachusetts, and when Maine’s cry for assistance from their Massachusetts government went unheeded it would begin the movement for Maine’s eventual statehood. 1814 would also be the beginnings of the British offensive in America. Although the British Navy had controlled the eastern seaboard of the United States since 1813 the war with France had limited a large land campaign. Britain now free from the conflict in Europe was ready to launch a major attack on the US cities of Washington DC, Baltimore and Philadelphia. The first encounter was the Battle of Bladensburg, just outside of Washington DC. The majority of American troops involved where the poorly trained state militia, while the British were battle hardened and disciplined. The result of that battle was what has been termed, “the greatest disgrace ever dealt to American arms.” The American militia broke rank and fled, with some running through the streets of the nation’s Capital in panic. On August 24 the British army entered Washington as President James Madison and Congress fled. British troops burned government buildings, including the Capital and the President’s house. 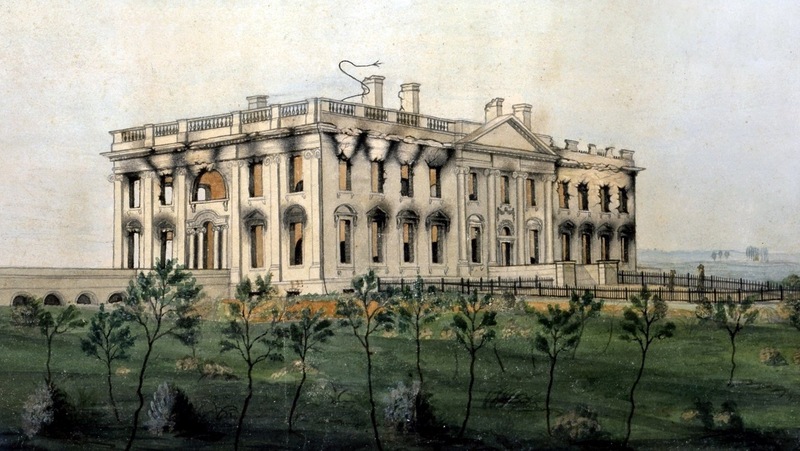 During the rebuilding of the President’s house it was found that white washing would hid the stains from its burning, hence the President’s house became then known as- the White House. The taking of our capital would be the high water mark for England. The British army and navy then moved on toward Baltimore. They believed that American resistance would be equally as weak there as it had been in Washington. 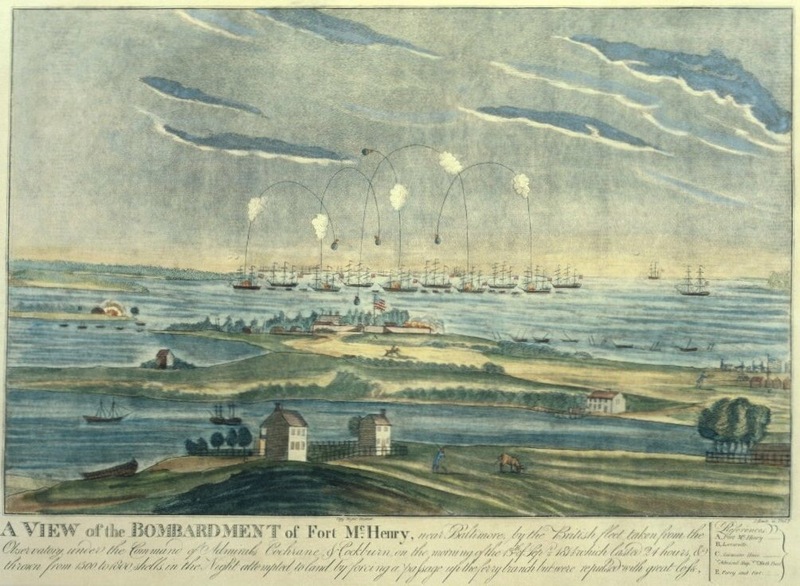 However on September 14 and 15, at the battles of North Point and Hampstead Hill, and the famous defense of Fort McHenry (Star Spangled Banner fame) they met a stronger and better trained American force of army regulars. The British could not break the American defenses so they withdraw back out to sea. Their new plan was to leave the U.S east coast and resume the offensive in the Gulf of Mexico at New Orleans. From the results of the Battle of Baltimore and also their defeat in the Battle of Plattsburg New York on September 6 – 11, the British felt that there was nothing to be gained by continuing the war. The United States also saw it as a stalemate with nothing to be gained by continuing, so on December 24 1814 the US and Britain signed the Treaty of Ghent, officially ending the War of 1812. However this news of the wars end had failed to reach the British fleet and army heading for New Orleans, and the American Major General that would be there to meet them. Major General Andrew Jackson would come out of this meeting of these two forces as a national hero that would rocket him to the Presidency. But before I discuss the Battle of New Orleans I’d like to give a brief background of this man that benefited most from that conflict. Andrew Jackson was born to an improvised family on March 15, 1767 in ether North or South Carolina. History isn’t exactly sure on which side of the state line he was born, and both states claim him for their native son. Jackson’s lifelong hatred of the British came about due his mother and two brothers dying while the British occupied the Carolinas during the American Revolution. Jackson studied law and was admitted to the North Carolina bar in 1787. Soon after he moved to the new territory of Tennessee and became the prosecuting attorney for what would be the city of Nashville. When Tennessee began its application for Statehood Jackson helped to write its constitution. He would also be one of Tennessee’s first members to the U.S. House of Representatives. Jackson decided not to run for reelection to the house but rather for the U.S. Senate. After only a year in that seat he resigned to take a Judgeship with the Tennessee Superior Court. While a judge he was chosen to command the state’s militia, and fate stepped in when the War 1812 broke out. Jackson received national notice from his five month campaign against the British supported Creek Indian Nation, and his victory at the Battle of Horseshoe Bend. Although Andrew Jackson was popular from the Indian campaign it would be the battle New Orleans that would make him an American household name. The attack on New Orleans was part of the British’s three part invasion strategy: Plattsburg, Baltimore and New Orleans. Their success had been checked by the Americans at both Plattsburg and Baltimore; their last chance to gain anything from the war was to win at New Orleans. Having New Orleans in British control would have given them power over the Mississippi River and American’s western trade. The British faced a hodgepodge American force comprised of army regulars, state militiamen, free blacks, New Orleans aristocrats, Choctaw tribesmen, and Jean Lafitte’s pirates. These numbered at around 5,300 men. Jackson and the Americans faced over 6,000 well trained British red coats that had just come from the Battle of Baltimore. Between December 23 and the 28, 1814 there were a few minor skirmishes between the two armies. The main battle finally occurred on January 8 1815, when British commander General Pakenham ordered a two-fold attack on the American’s. The first phase was a partial success when Pakenham’s men took a small American artillery post. However when a rifle shot killed their commander, Colonial Rennie, the British soldiers panicked into a hasty retreat. That was one of the weaknesses of the British soldiers at that time; they were effective only when an officer was leading them. The next phase of Pakenham’s plan was to march directly against Jackson’s main line of defense with the full body of his troops. He hoped that the morning mist would hide his men’s advancement. However the sun burned off the fog leaving the British soldiers completely visible and open to American rifle and cannon fire. The British plan unraveled, and although the red coats fought bravely the American fire was too overwhelming. After 30 minutes the British soldiers retreated in droves leaving behind a field of dead and dying. Afterwards American Major Howell Tatum said of the state of the British casualties, “truly distressing…some had their heads shot off, some their legs, some their arms. Some were laughing; some crying…there was every variety of sight and sound.” In the end the British had lost over 2,000 of its best soldiers, including General Pakenham. Andrew Jackson’s losses were less than 100 men. Although the stunned British army languished in Louisiana for a few days after the battle, and there was an abortive navel attack of Fort St. Philip, the fighting was over. As the British troops were boarding their ships for England Andrew Jackson paraded into New Orleans to great celebration, rivaling any Mardi Gras, or a Caesar marching into Rome. 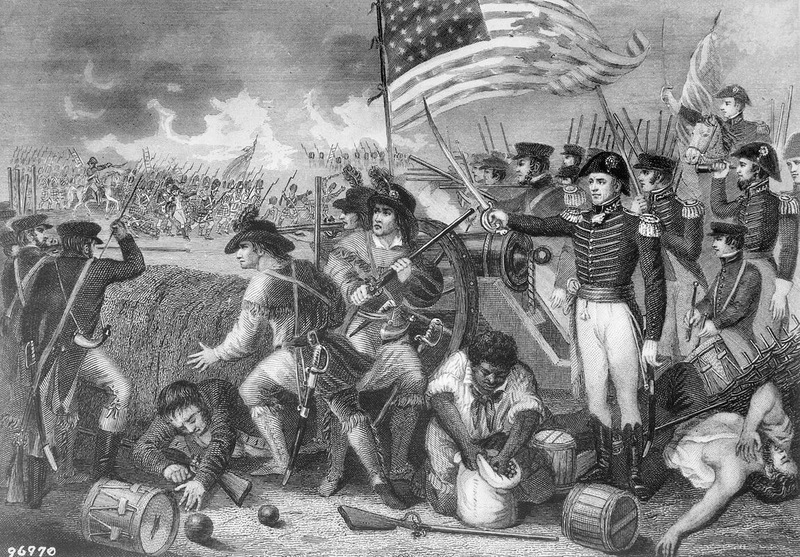 Battle of New Orleans and the end of the War of 1812 gave the young United States a shot in the arm of national pride and honor. Even though strategically America gained nothing, they had beaten the great British army and navy. The War of 1812 has been called our second revolution, and this one we won on our own. The War of 1812 had shown that the United States needed a strong national military force, the old militia system wasn’t effective. The national pride of beating the 19th century’s superpower would inspire the United States to become more globally active, it would also give drive to the nations western expansion challenging Span and Mexico. It was the war that put the United States on the road of being a major power in the world. Of further interest: While traveling in Canada, especially near Niagara and the Great Lakes, you’ll find monuments to the War of 1812. The differences in these, as opposed to our monuments of that war, is these hail Canadian victories over the United States.